“Love. It’s what makes a Subaru, a Subaru.” It’s hard to argue with the popular automaker’s latest advertising slogan. Hard, also, for my 13-year-old not to repeat it every time we went somewhere in the new Ascent, Subaru’s first three-row vehicle and the biggest vehicle it’s ever built. Indeed, people love their Subarus; they are second only to Toyota in terms of owner loyalty, according to Edmunds 2018 Loyalty Report, leaping from 45 to 61 percent over the course of a decade. This is due, in no small part, to the explosion in popularity of the SUV market, where Subaru excels. Again according to Edmunds, in 2017, 75 percent of SUV owners who traded in their SUVs did so for another SUV. Ascent joins Subaru’s stellar line-up of all-wheel drive SUVs and crossovers that includes the compact Crosstrek, midsized Forester, and Outback wagon models. 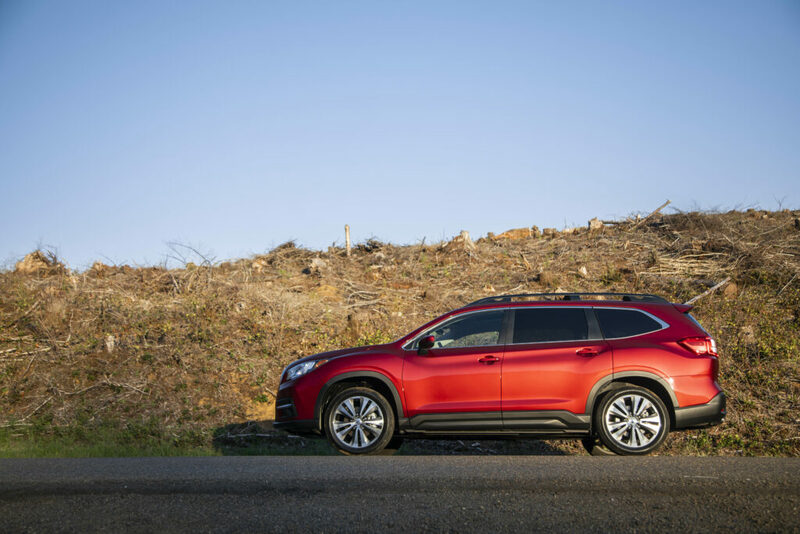 Basically, for the Ascent, Subaru took everything that it’s good at – sporty all-wheel drive, spacious, comfortable interiors, rugged exterior appearance – and expanded it into a bigger, family-sized package with flexible storage and seating options, and a variety of tech and safety systems. I first drove the new Subaru Ascent at the Southwest Lifestyle Media Drive in Chandler, Arizona, this past October, where it took top honors as SUV/Crossover of the Year – Best Value. At that time, I was impressed with its looks and road manners, as well as an extensive list of standard features that includes four USB ports (up to eight are available, depending on trim and option packages), 19 bottle and cup holders, three-zone climate control, a 6.5-inch touch screen, Apple CarPlay and Android Auto. Most buyers will likely opt up to the Premium trim, which I had for a weeklong test drive, which adds spill-repellent cloth upholstery, 8-inch touchscreen, Wi-Fi hotspot, rear-seat climate controls, heated seats and more niceties. Premium and above trims offer a second-row captain’s chair option, for seven vs. eight-passenger seating, but easier access to the third row. So after my initial drive of the Ascent, I had the opportunity to live with it for a week. That’s when the “love” factor touted in the ads kicked in. The Ascent fit seamlessly into my busy life. Need to get a kid to soccer practice? Check. Have to get an electronic keyboard and stand, along with a few kids, to a choir concert across town? Check! Trip to Costco? Done. Ikea? No problem. And while I didn’t take it on a road trip this time around, Ascent is the ideal family vehicle for a long drive. The ride is comfortable, it’s packed with enough amenities to mitigate “Are we there yet?” queries and bickering over whose device to plug in, and it was named an Insurance Institute for Highway Safety Top Safety Pick +, its highest rating. Power from the all-new 260-horsepower BOXER engine is superb, and it is paired with a CVT featuring eight-speed manual mode. With all-wheel drive and Subaru X-Mode, standard on all trim levels, Ascent is a true go-anywhere vehicle, with the capacity to tow up to 5,000 pounds, the most of any Subaru, ever. There’s so much to like about the new Ascent. Not least of which is that it can haul up to eight passengers comfortably, nearly anywhere, and is equipped with the most desirable features for a price tag under $40,000. Subaru is on a winning streak, having just achieved 10 consecutive years of record sales. 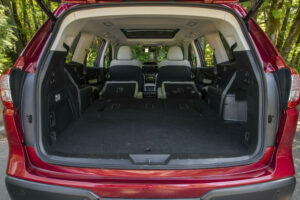 Ascent broadens its audience to members of the minivan set who want or need the seating capacity and flexibility, but have a bit of an adventurous spirit. What I Loved: To begin with, top-notch safety ratings, standard all-wheel drive, X-Mode with hill-descent control to bolster its off-road chops. Even though it has high enough ground clearance for adventuring, the step-in height is comfortably low for all passengers. It’s an excellent everyday driver and perfect family road-trip vehicle at a great price point. I also love the plethora of available USB ports, and Auto Vehicle Hold, which keeps the vehicle in place at a stop without having to continuously depress the brake pedal. And EyeSight Assist Monitor, which provides system information on the windshield in front of the driver. What I Didn’t: It’s a very minor thing, mostly attributable to user error, but… Our Ascent Premium came with the power rear liftgate with programmable height setting. At one point, I inadvertently set it to open only about halfway, and it took a trip to the owner’s manual to reset it. If tech confounds you, there may be a slight learning curve, albeit less than you’ll find with many new vehicles.